What is stock photography? In every walk of life you see thousands of photographs in magazines, on web sites, billboards, product packaging, and on television. Very few of these images were created for a specific purpose or project. Most of what you see is stock photography. Stock photos are ready-to-download files that can be used in advertising, magazines, promotional brochures, etc. Rather than hiring photographers, most editors, publishers and web masters depend on stock photography for affordable prices and exceptional quality. There are two ways to purchase stock photography; royalty-free and rights-managed. Royalty-free means you only have to pay once to use the file multiple times but you are not purchasing exclusive use of the file. With rights-managed files, you have exclusive use of the file for the contracted period. ​Last year, 2018, was a record year for my stock photo sales. I ended the year with 1059 picturs downloaded and published by various magazines, advertisers and web sites. This is the first time that my sales have surpassed 1000 downloads in a given year. 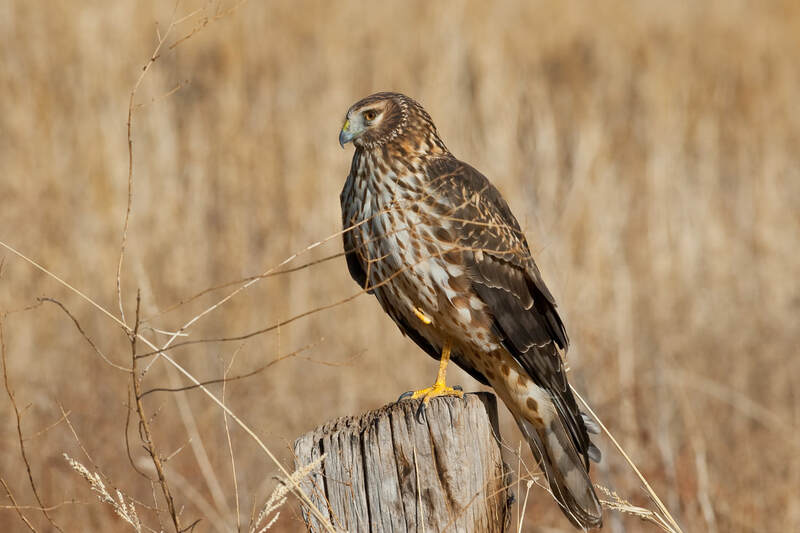 Download number 1000 on Dec 11, 2018 was the Northern Harrier Hawk pictured above. To see how some of my photographs have been used, please check out my Published Work page. Photographs of streams and waterfalls appear often on postcards, calendars and note cards. Their special effects seem to express a feeling of motion. You have probably wondered how the photographer captured that feathery texture in the water. This technique is not difficult to accomplish. It can be mastered by anyone who has an adaptable camera (one in which you can adjust the shutter speed and aperture) and a tripod. A shutter release cable is helpful but optional. The trick is to shoot at a slow shutter speed such as 1/4 second, 1/2 second, or even one full second. This will have a slight blurring effect on the fast moving water, which will suggest motion in the finished picture. Use of a tripod or other camera support is mandatory. It is extremely difficult to hand-hold the camera at such a slow shutter speed without blurring the entire picture. If a cable release is not available, the camera's built-in self timer may be used to release the shutter. Either method will insure the camera remains immobile during the long exposure. Adjust the camera's ISO number to the least sensitive setting for this type of photography. A larger ISO may not result in a slow enough shutter speed. I prefer to shoot waterfalls on an overcast day or in the shade on a sunny day. Water reflects much more sunlight than rocks and trees. In direct sunlight, the reflection on the water may cause undesirable bright spots in the picture. There are many places to go for stream and waterfall pictures. 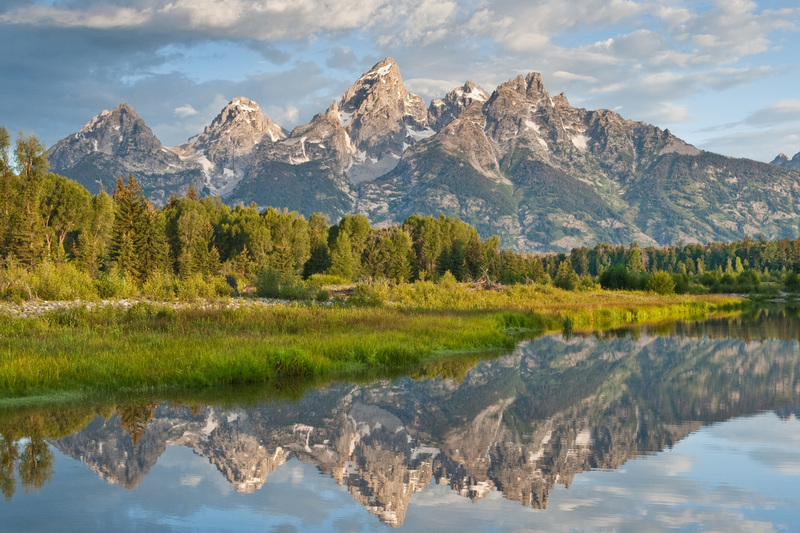 National parks, wilderness areas and even city parks are a few possibilities. I try to concentrate on small meandering streams with trees and green moss growing on the rocks. The greenery and rocks add perspective and help frame the composition. 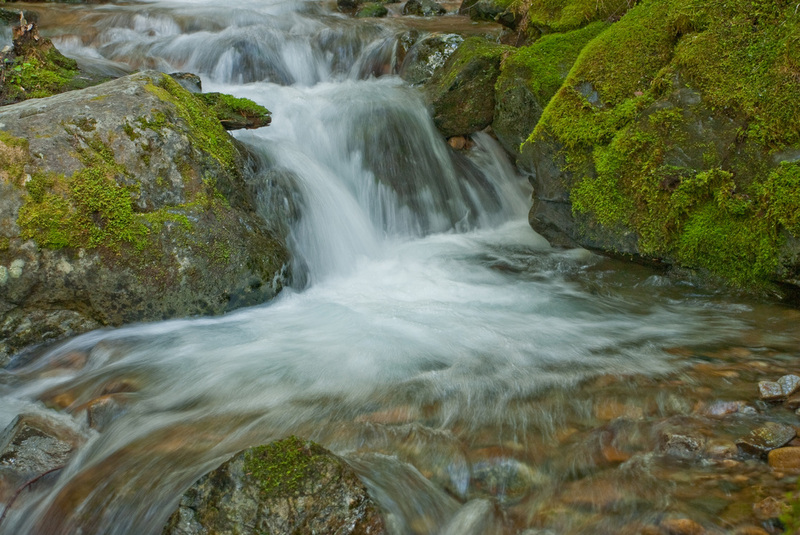 ​Try stream shooting next time you venture out into the woods or stroll through the park. You may return with some calendar or postcard scenes of your own. ​Want to create a unique expression of art, one that no one else can re-create? Try shooting a sunset picture. A sunset, like the snowflake, is one of natures unrivaled creations. There are no two alike! When properly photographed and displayed, each sunset can reveal an exhilarating and incomparable work of art. For equipment, you will need an adaptable camera (one in which you can adjust the shutter speed and the aperture). Optional equipment might include a tripod and shutter release cable. 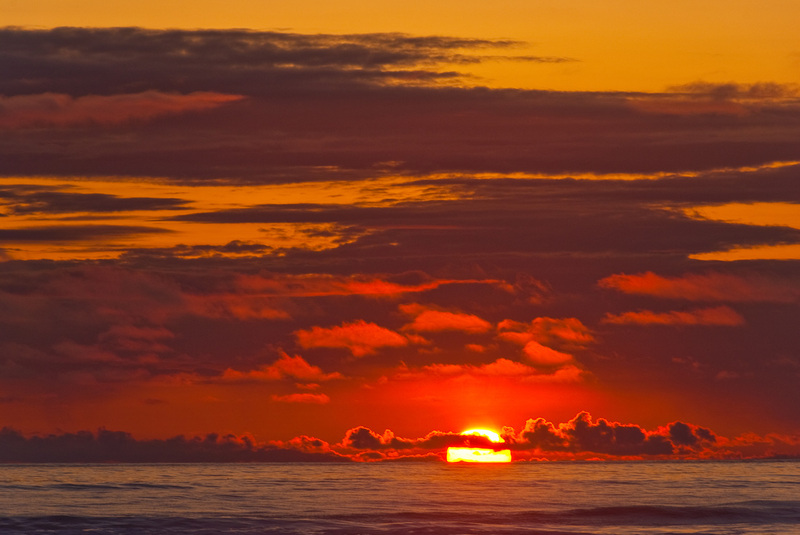 Also, a telephoto lens can be used to make the sun appear larger in the picture. ​Fortunately, sunsets are among the easiest pictures to take because exposure is not a critical factor. I determine my exposure by using the camera to take a meter reading off the brightest part of the sky, excluding the sun. With this reading as a starting point, I then bracket my settings (over and underexpose by one or two f-stops) to get different effects. When using a telephoto lens, do not look directly at the sun. It can harm your eyes. 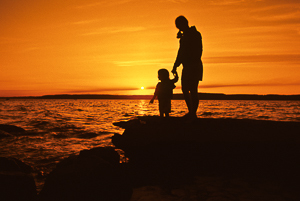 Foreground objects will appear as strong silhouettes, advantageous to the creative photographer. Trees, boats, rocks and even people can be used as a foreground to frame the picture, creating a strong composition. ​Keep on shooting, even after the sun disappears. Some of the most subtle coloring in the sky is seen up to on-half hour after the sun has set. Also, try shooting a sunrise. Remember, it's just a sunset in reverse and the same rules apply. A great sunset picture doesn't even need to include the sun. Turn around and see what the sun is lighting behind you. Mountains and trees take on a special glow when illuminated by the setting sun. Whether it's a trip to the ocean or a hike in the mountains, you can return with a unique work of art if you take the time to view and photograph the disappearing sun, the subjects it illuminates and its delicate expression of color. Washington State has many wonderful features but is best known for its really big coniferous trees. Many of the largest, oldest and tallest of the conifers can be found here. Almost all of them remain dark green throughout the year giving Washington its nickname "The Evergreen State". But there’s a very unusual conifer tucked away in the high alpine basins of the Cascade Range. Each October when fall comes to the high country, this unusual conifer’s needles change from green to glowing gold before they drop from the tree. The Alpine Larch tree is a deciduous conifer. Like other deciduous trees that drop their leaves every fall, the Larch drops its needles. The Alpine Larch grows in sparse pockets near treeline at 6000 to 7000 feet above sea level. The short, soft needles begin changing colors in late September and usually turn gold around early October. The window of opportunity to see fall colored larches is short and unpredictable. Autumn storms can strip the trees of their needles overnight or dump snow on the trails, making access difficult. There are few good places in the state to find the Alpine Larch and getting to them is not easy. Most places require hiking into remote back-country. Headlight Basin, in the Alpine Lakes Wilderness northeast of Cle Elum, has one of the largest concentrations of larches in the state. 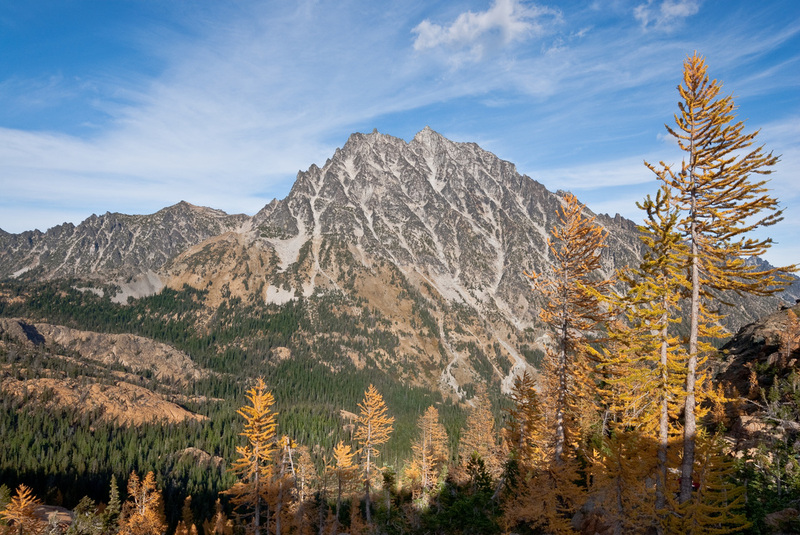 Ingalls Pass, above the basin, has stunning views of the larches and also the rugged south face of Mount Stuart, Washington’s tallest non-volcanic peak. Ingalls Pass and nearby Lake Ingalls are very popular hiking destinations throughout the summer. In the fall this area becomes a magnet for hikers wishing to view the magnificent colored larches. Headlight Basin also has a resident population of mountain goats which are very fun to watch and photograph. The Palouse is a rich agricultural area encompassing much of southeastern Washington State and parts of Idaho. It is characterized by low rolling hills mostly devoid of trees. Although many crops including barley, lentils and chick peas are produced in the area, much of the winter wheat production in the United States comes from the Palouse. Wheat grown in the rich silty loess soil yields up to 100 bushels an acre, twice the national average. And much of this production is done without benefit of irrigation. Winter wheat is planted in the fall. It germinates after planting and then remains dormant through the winter. Growth resumes in the spring after the snow melts. Harvesting is usually done in the summer or early fall after the wheat turns a rich gold color. 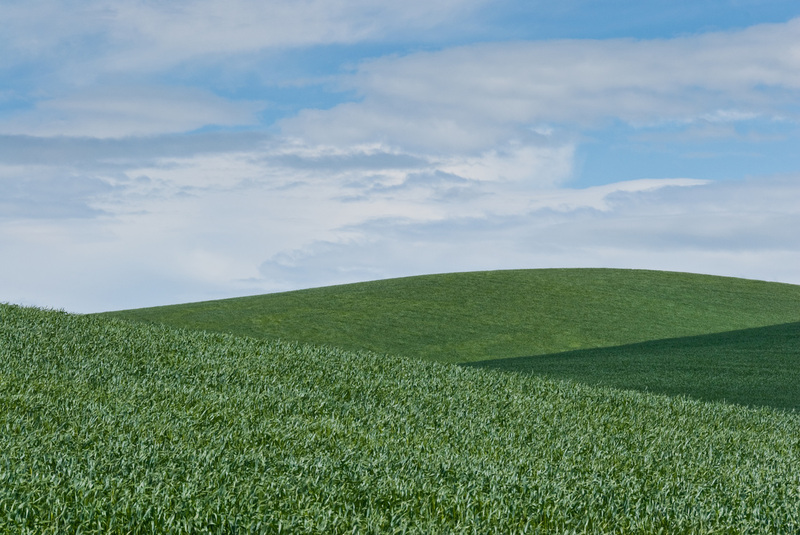 Photographers are drawn to the Palouse for its wide open landscapes and ever changing colors. In the spring it is a visual mosaic of green. By late summer the green changes to "amber waves of grain" before and during the harvest. In the winter, deep snow carpets the landscape with a brilliant white. The area is mostly rural and sparsely populated, punctuated by quaint historic towns like Colfax, Walla Walla, Palouse and Pomeroy. For an overview of the Palouse, the best place to visit is Steptoe Butte. This quartzite "island" at 3612 feet above sea level is one of the highest points in the area and provides a 360 degree ever-changing view of the Palouse Hills. Steptoe Butte is a Washington state park about 12 miles north of Colfax. There is a narrow paved but rough road leading to a parking area at the summit. A Washington State Discover Pass is required to park in the lot. Expect to see other sightseers and photographers except when the road closes during the winter snows. Other great possibilities for photography include driving the backroads around Colfax, Palouse and Pullman. The mostly gravel roads are in amazingly good shape and take you through endless fields of rolling hills with very few farmhouses. You won't see very many other cars either. Just don't get lost. I found my way from Colfax to Palouse using the backroads and eventually turned on my GPS to get to Pullman. Even these remote backroads are on my GPS map. Oregon has one of the most beautiful and unspoiled stretches of coastline in the United States. Oregon's Pacific Coast extends 363 miles from the Columbia River to the California border. The 1967 Oregon Beach Bill declared that the people of Oregon own all land within sixteen vertical feet of the average low tide. 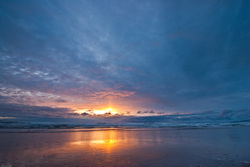 This law guarantees that the public has free and uninterrupted use of the beaches along the entire Oregon coastline. The Oregon Coast is a series of long sandy beaches interrupted by headlands jutting out into the Pacific. The coastline has basalt cliffs, rock stacks, numerous tide pools, 11 historic lighthouses and an amazing variety of wildlife. You may see colonies of sea lions lounging on the rocks and varieties of birds and other wildlife too numerous to mention. At every turn in the road, rock formations jut out of the ocean. As if this weren't enough, nature puts on her most glorious show of all at sunset. The Oregon coast is indeed a magnificent place. Three of my favorite places on the Oregon Coast are Cannon Beach, Heceta Head and Yaquina Head. 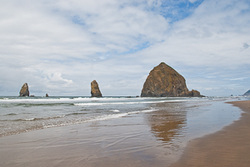 Haystack Rock at Cannon Beach may be the most iconic and often photographed feature on the Oregon Coast. The basalt monolith stands 237 feet above the beach and its tide pools are home to a wide variety of sea life. The rock is also a nesting and gathering site for puffins, terns and many other seabirds. Heceta Head Lighthouse is perched 150 feet above the Pacific Ocean on a rugged and heavily wooded headland just north of the town of Florence. It is one of the most visited lighthouses in the United States drawing thousands of visitors each year. Although you can get very close to the lighthouse and keepers cottage, the best views are from a pullout on Highway 101 less than a mile south of the lighthouse. Yaquina Head is on a mile long penninsula north of the town of Newport. 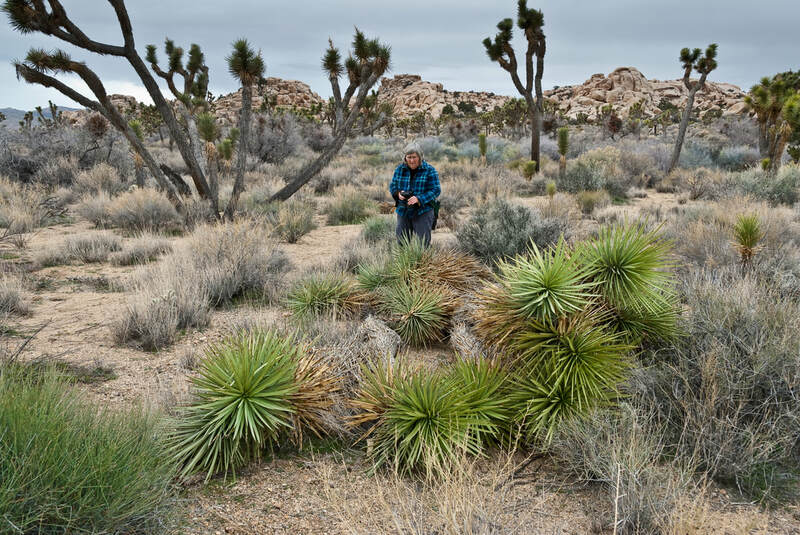 The scenic area has been designated as a National Outstanding Natural Area and is managed by the US Bureau of Land Management. Standing 93 feet tall at the westernmost point of the basalt headland, the Yaquina Head Lighthouse has been guiding ships along the Oregon Coast since the light was first lit on August 20, 1873. The offshore rocks and islands are a refuge for harbor seals and a spring-summer nesting place for thousands of seabirds. Gray whales can be spotted during their annual migration between Mexico and Alaska. Cobble Beach below the lighthouse is scattered with millions of large and small cobble-like rocks. When the tide is low the ocean floor reveals pools of colorful animals including sea stars, sea urchins, and giant anemones. Check out Best Beaches in Oregon​ to find out more about the Oregon Coast. The Columbia Gorge is an area of incomparable scenic beauty that forms the border between Oregon and Washington State. 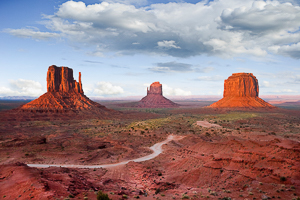 The area cuts through the mountainous Cascade Range and boasts vast forests to the west, arid shrub-steppe to the east and the mighty Columbia River throughout. The gorge is well known for its many waterfalls on both sides of the river. The most famous of the waterfalls is Multnomah Falls, located along the historic Columbia River Highway in Oregon between the towns of Corbett and Dodson. I had wanted to take a picture of Multnomah Falls for a long time. Finally the time came to take a trip in the Columbia Gorge. When I left Eastern Oregon it was warm and sunny. As I drove west on the old Columbia River Highway it started raining. By the time I reached Multnomah Falls, which is on the wetter side of the Cascade Range, it was raining very hard. I had serious doubts about getting a decent picture but went ahead and set up my tripod and camera anyway. Typically, when I shoot waterfall pictures, I use a time exposure of 1/4 second or longer. This gives a feathery texture to the water and suggests motion in the waterfall. For this picture I used a very wide angle lens (10mm) so I would take in both the upper and lower falls as well as the bushes in the foreground. As I was shooting, I was getting thoroughly wet and so was my equipment. In reviewing the shots on my camera's screen, I noticed big water droplets in the picture. I removed the protective filter from my lens and put my hand over the top to keep out the rain. I snapped another series of pictures, packed up my equipment and sought shelter. Out of the 40-50 pictures I took that day, the picture above was the only one that had the effect I was looking for and didn't have any visible water droplets. I was very fortunate that the people were standing on the bridge to give scale and perspective to my picture. I was also lucky that my equipment didn't get drenched beyond repair. When my daughter was in college near Pittsburgh, I spent many days roaming the backroads of Western Pennsylvania, enjoying the rural countryside and rolling woodlands. One day I happened upon the small town of Punxsutawney, northeast of Pittsburgh. Punxsutawney is typical of the small towns in Western Pennsylvania. It's a quaint town in a small river valley surrounded by rolling hills. Gobbler's Knob is one of these hills and it's where the locals and tourists celebrate Groundhog Day every February 2nd. According to legend, Punxsutawney Phil the groundhog emerges from his burrow on this day and if he sees his shadow we are in for six more weeks of winter. If he doesn't see his shadow, there will be an early spring. The whole premise of a groundhog being able to predict the weather was intriguing so I decided to drive up Gobblers Knob, look for groundhogs and check things out. Along the way I passed a group of wild turkeys (gobblers) which seemed promising considering I was on Gobbler's Knob. Reaching the top of the knob I drove into a large park that's used for the Groundhog Day celebration. There was nobody around to answer questions and I didn't see any groundhogs either. Information on a sign said that Punxsutawney Phil and his "wife" Phyllis actually lived back in town at the library. So back to town I headed and found the library. Sure enough, I was able to see Phil and Phyllis from the outside of the library through the viewing window. Disappointed that I was unable to see a groundhog in the wild, I left town and continued my travels. Years later, when I started selling my photography through Getty Images and Istockphoto I noticed a sales trend. Every January there would be a sudden spike in volume, especially in pictures of marmots. Puzzled by all the sales of marmot pictures, I decided to find out how my pictures were being used. After a few Google searches I found that People for the Ethical Treatment of Animals (PETA) had used my picture of an Olympic Marmot to represent a groundhog. That got me thinking. The groundhog must look a lot like a marmot. Obviously, it was time for more research. Marmots are large furry members of the squirrel family. They are about the size of a small dog. I see them a lot and photograph them when I'm hiking. Marmots typically live in burrows dug from the soil or within rockpiles. They hibernate in their burrows through the winter. Marmots are highly social animals and may be seen in families. To communicate, they whistle loudly, especially when alarmed. In my home state of Washington we have three distinct varieties of marmot. The Hoary Marmot (Marmota Caligata) lives in the Cascade Range, the Olympic Marmot (Marmota Olympus) is endemic to the mountains of the Olympic Peninsula and the Yellow-Bellied Marmot (Marmota Flaviventris) dominates the "desert" of central and eastern Washington. Marmots are mainly herbivorous. Their diet consists of grasses, berries, lichens, mosses, roots, and flowers. 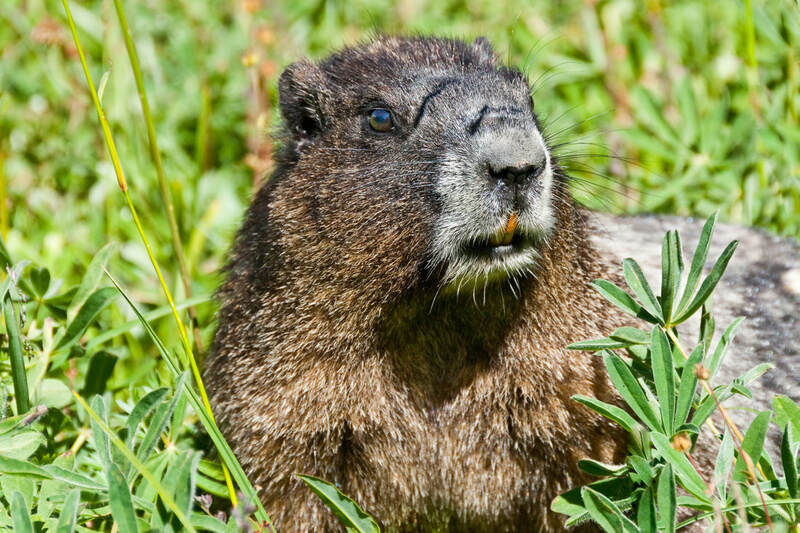 Groundhogs (Marmota Monax), also called woodchucks, land-beaver or whistle-pigs are a very close relative of the marmot and are similar in size and appearance. 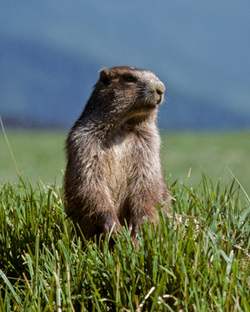 As I found out, it is very easy to use a picture of a marmot and call it a groundhog. I've given up looking for groundhogs these days. However, when I am hiking in the mountains, I always enjoy listening for marmots and watching their antics among the rocks and meadows.